There is no single statute of limitations for which records a business needs to retain and when they can be disposed of. To make matters more complicated, the federal and state governments often provide different time tables, and the rules change. The CEO added, “To add to this confusing set of rules, individual states like Massachusetts have set their own set of requirements. ” The policy template provides record retention tables with detail time periods for specific records. Included are citations that that state which records apply to which laws. Janulaitis said, “Companies need to have a written policy devoted to record retention. 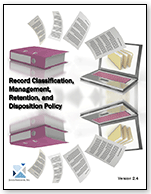 ” The Janco template contains: a definition of the purpose of the policy; who is affected by this policy; what type of records, data and electronic systems are covered; defines key terms especially legal and technical terminology; outlines the procedures for ensuring records are properly retained; outlines the procedures for ensuring records are properly destroyed; defines the litigation exception processes and how to respond to discovery requests; lists the responsibilities of those involved in record retention activities; forms that help companies build customized tables showing the information type and its corresponding retention period; document the specific duties of a record retention team; and a job description for a Manager of Record Administration. The Record Classification, Management, Retention, and Destruction policy can be purchased as a single item for $249, bundled with the Backup Policy for $399, or in the CIO Infrastructure Policy Bundle (12 individual policies) for $799. For more information go to https://www.e-janco.com/recordmanagementpolicy.html . All of Janco’s products are delivered electronically and come as an easily modifiable Microsoft WORD files. They include everything needed to customize them to fit an organization's specific requirements. The templates contain proven written text and examples.